Sorry for the super late post! I’ve been busy doing so many fun and exciting things, like going to a taping of The Daily Show, seeing Batman, and going to the beach! Anyway last weekend I had a Super Fancy Dinner Party. With paper plates because I had five people over and only four plates. 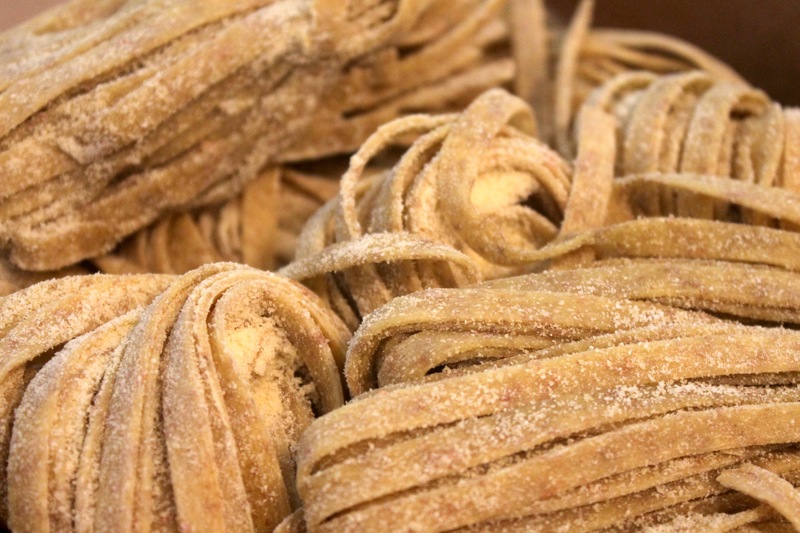 I went to this super fancy grocery store, Eataly, right around the corner from my apartment, and got all sorts of great, overpriced ingredients. Serves 6. Original recipe here. 3. Spread tomato sauce on the bottom of a 9×13 pan. 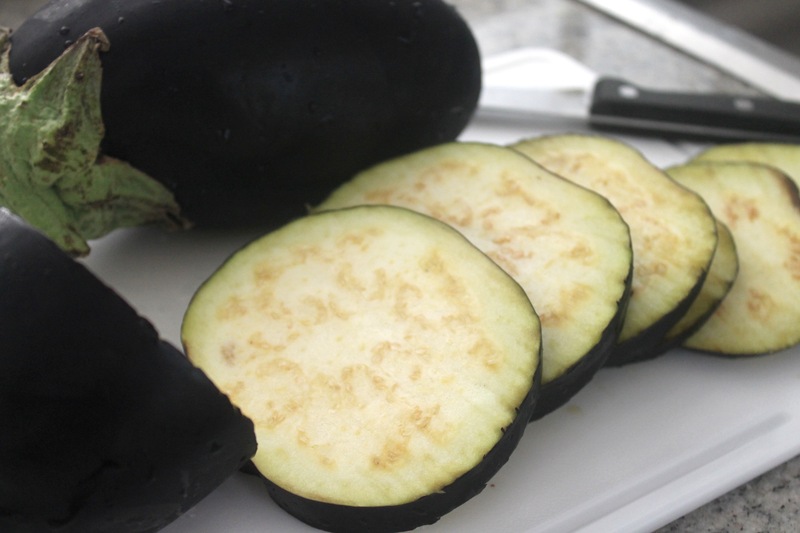 Place down a layer of eggplant slices, and sprinkle with both cheeses. 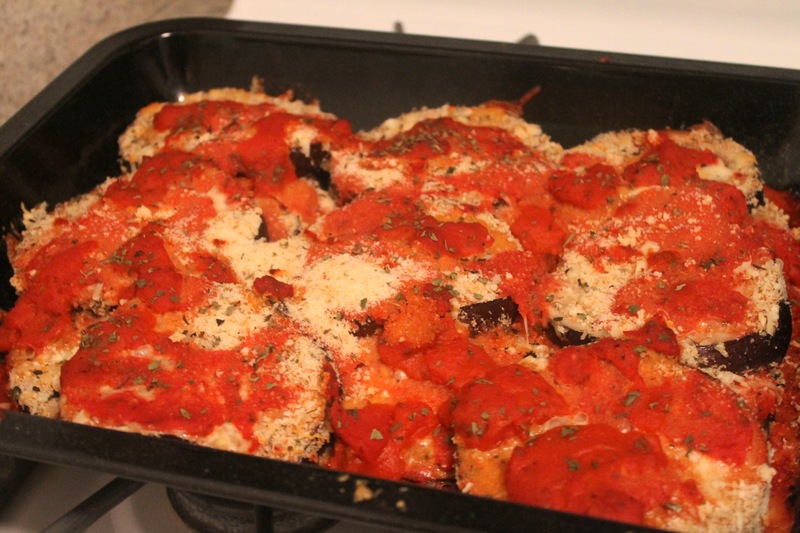 Add another layer of sauce, eggplant, and cheese, continuing until you’ve used all the eggplant. Top the final layer with sauce and cheese. 4. Bake for 35 minutes. Serve on top of pasta. Now, if you know me at all, you know I couldn’t stop there. Obviously I made dessert. How delicious do those look? I recently got a super cool mini cheesecake pan from Norpro, which I’ve been dying to use. 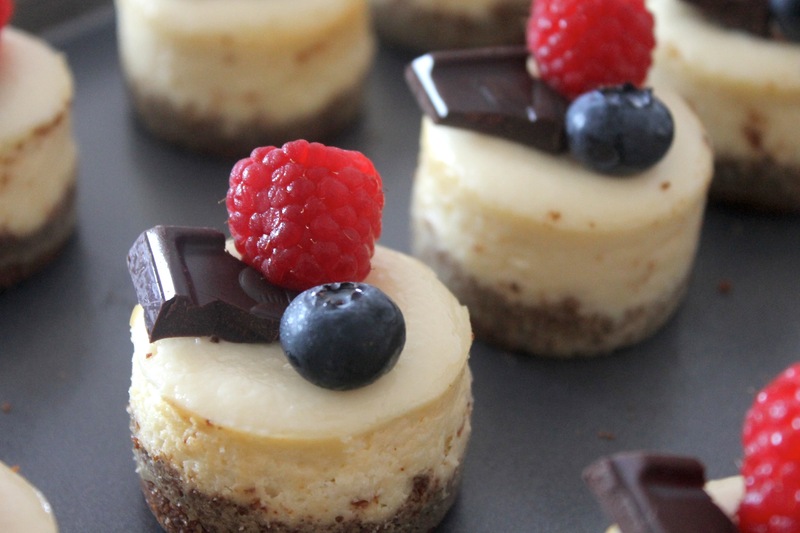 It’s funny – I think a lot of people think cheesecake is really difficult to make, but these were so easy. The only thing is you really can’t do it without a mixer – you’ll never smooth out all the chunks. Makes 12. Adapted from here. 2. Crush graham crackers, either by hand or in a food processor. Mix with butter and sugar. 3. Divide crust between wells of pan (about 1.5 Tbsp each). Press down evenly in each well – I used a shot glass to help since it’s a little hard with your fingers. 4. Bake crusts for 10 min. While they cool, begin the filling. 5. Thoroughly mix cream cheese, eggs, sugar, vanilla, and lemon juice, using either an electric mixer or a food processor. 6. Fill each well about to the top and bake for 15 minutes. 7. Remove from oven and let cool. Then remove cakes from pan and chill in the fridge for at least an hour. 8. 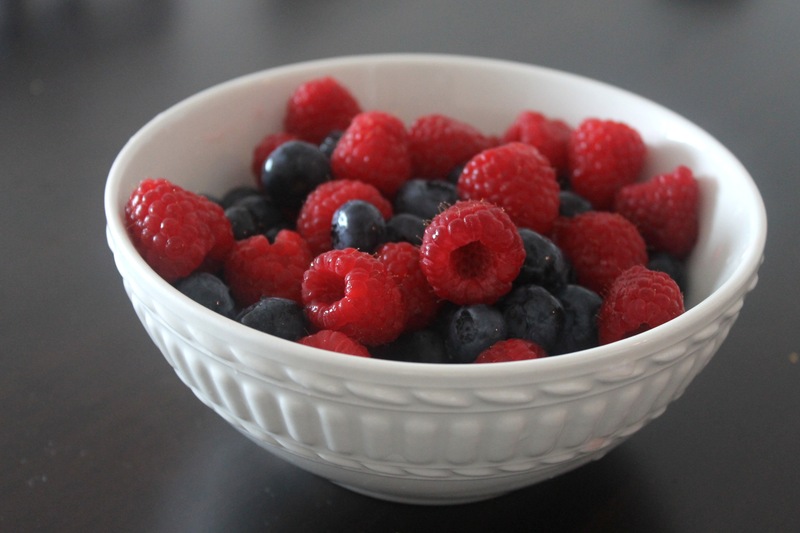 Garnish with berries and dark chocolate to serve. This entry was posted in Cupcakes and Cakes, Dessert, Entrees, Pasta and Noodles and tagged blueberry, cheese, chocolate, eggplant, raspberry, tomato by Alyssa G. Bookmark the permalink. 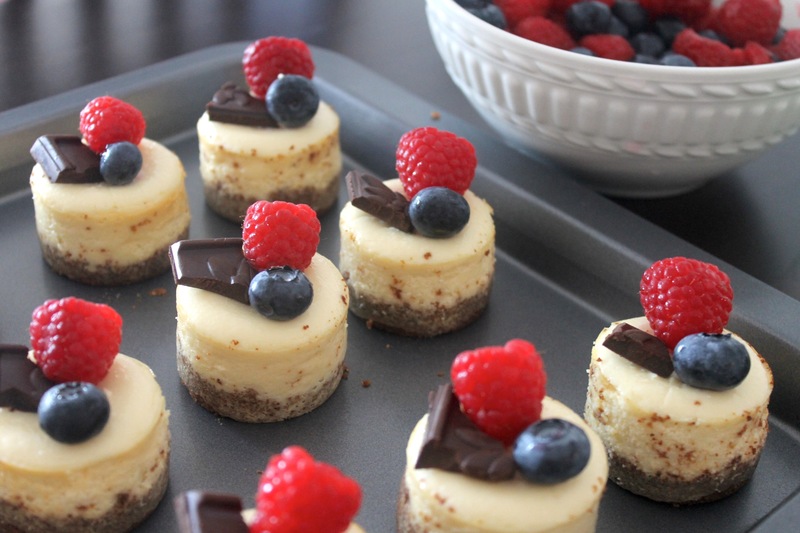 Those mini cheesecakes are beautiful and so classy looking! Looking forward to trying them out! Thanks for sharing.